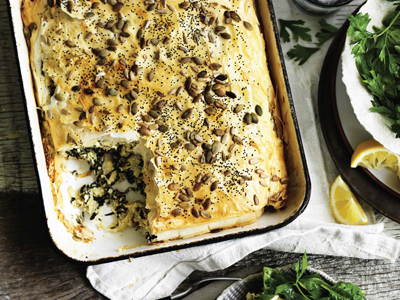 Add more greens to your diet with this Cheese & Swiss Chard Borek Recipe from ALMOST VEGETARIAN by The Australia Women’s Weekly Test Kitchen. This hearty green is filled with vitamins A, C, and K, magnesium, potassium, and iron. Make this colorful and tasty side dish today! 1. Preheat oven to 325°F. Grease an 8¾-inch x 12¾-inch x 2½-inch rectangular ovenproof dish. 2. Trim 1½ inches from swiss chard stems; separate leaves and stems. Finely shred leaves; finely chop stems. You will need 4 cups shredded leaves and 1½ cups finely chopped stems. 3. 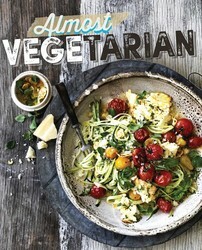 Lightly spray a large frying pan over high heat; cook chard leaves and stems for 2 minutes or until wilted and tender. When cool enough to handle, squeeze excess water from chard; set aside to cool. 4. Whisk 4 of the eggs in a large bowl until combined. Add cottage cheese, feta, sour cream, soda water, and chard; stir to combine, season. 5. Layer five sheets of pastry, spraying each sheet with oil; place on base of dish. Pour 1 cup of cheese mixture on pastry. 6. Layer two sheets of pastry, spraying each sheet with oil; place on cheese mixture. Pour 1 cup of cheese mixture on pastry. Repeat layering with two more sheets of pastry and remaining cheese mixture. Layer five sheets of pastry, spraying each sheet with oil; place on cheese mixture. 7. Whisk remaining egg in a small bowl. Brush egg over top of pie; sprinkle with seeds. Bake pie for 50 minutes or until golden and cooked through. Tip: When you’re not working with filo pastry, keep it covered with a clean, damp kitchen towel. This will help keep it from drying out. Make the perfect roast chicken to go with this yummy side.